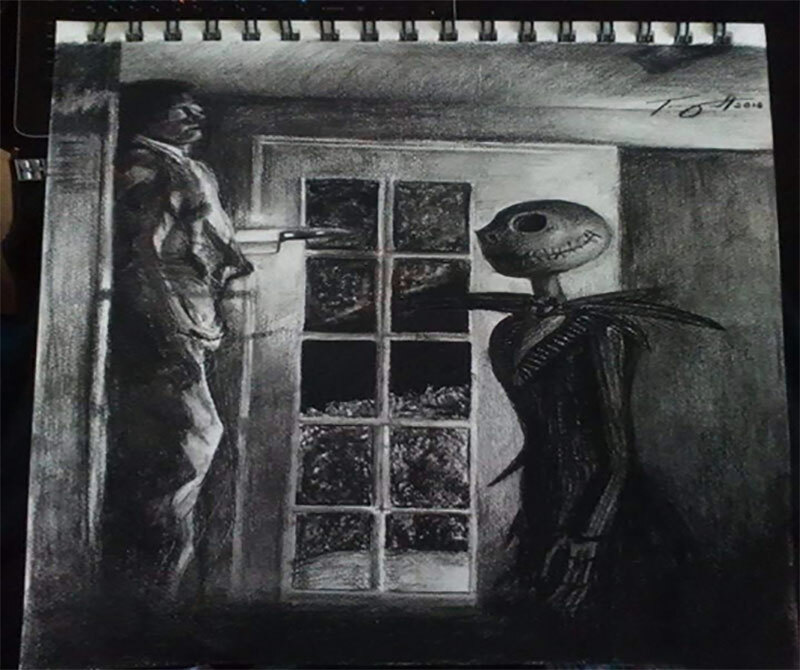 About two Christmases ago, I received a black and white collage of the original “Halloween” movie as a gift. I thought the drawing was incredible. 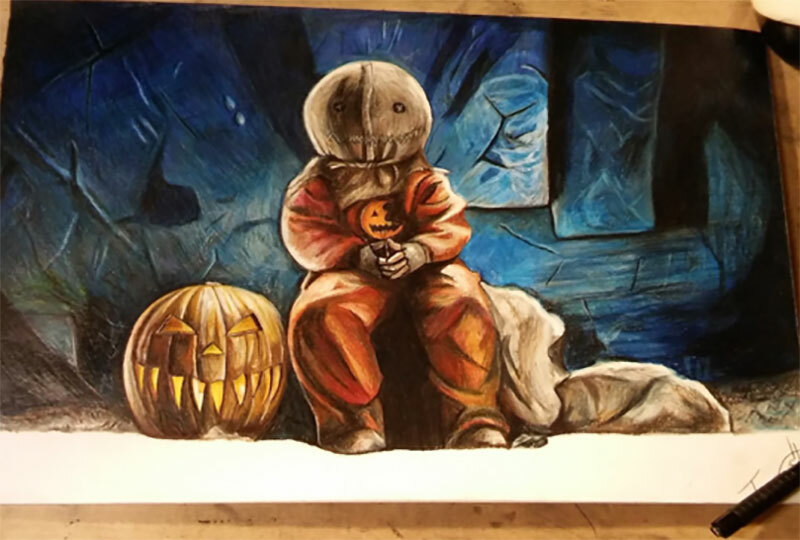 I have been taking this print with me to various horror conventions to get it autographed. Over the past few years I have obtained Tony Moran, Nancy Loomis, PJ Soles, and Charles Cypers on the collage. My interest in this drawing has lead me to find and begin following the artist known as Tony Orcutt. The following is my interview with this talented artist. 1. Please tell me a little about yourself (age, where you are from, and what people should know about you). 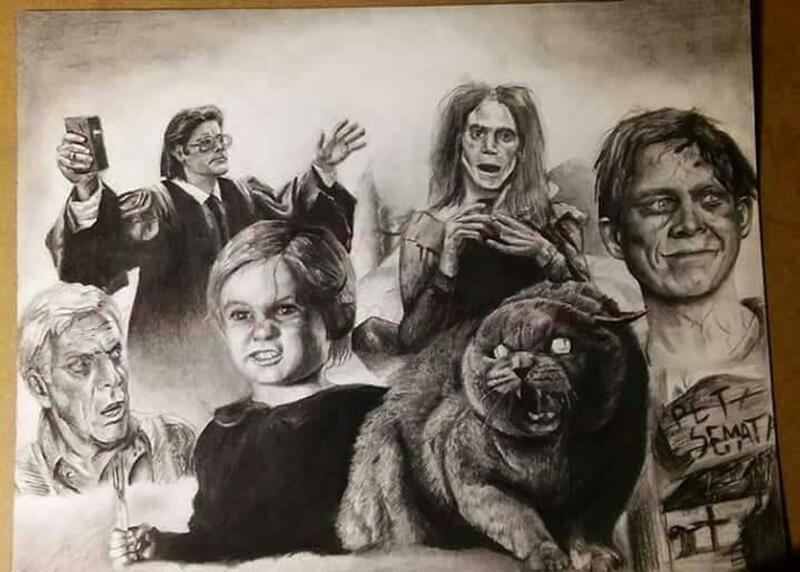 My name is Tony Orcutt, I am 33 years old and I love horror and drawing above all else. 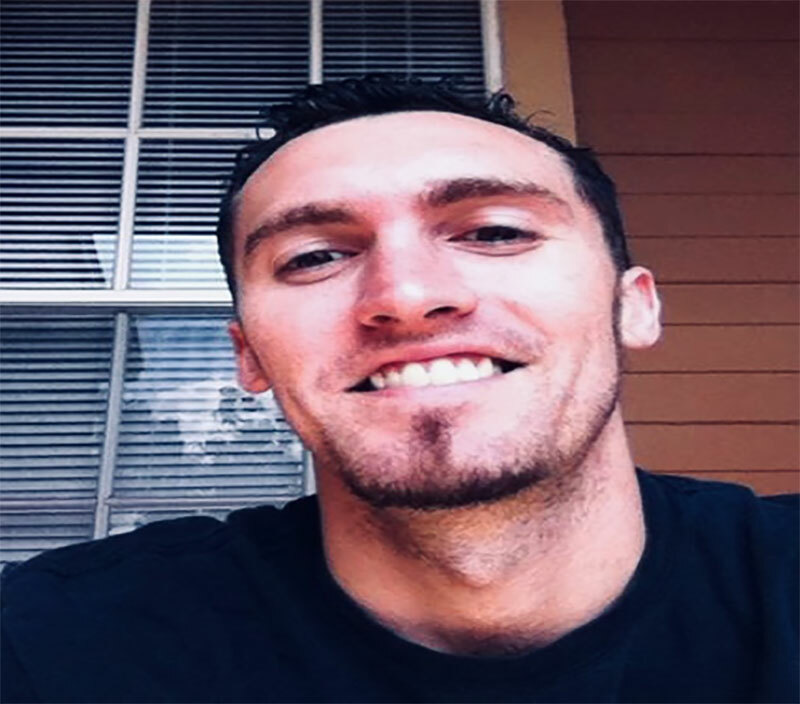 I was born and raised in Houston, Texas, and I have called San Antonio my home for over 5 years. I do the convention and art circuits here. My roots are firmly planted in Texas even though my girlfriend is from Poland, so each of the last couple of years I’ve spent about half of the year in Warsaw. The great thing is I still have a company I ship from in the States that allows me to get all my work out to my fans back home in a timely fashion. One thing many people don’t know about me is that I went a really long time without drawing at all. People assume I’ve been drawing all my life but honestly, even though I enjoyed drawing some in middle school and high school, I never really took it serious as anything more than a hobby back then. I didn’t even really think of my work as anything special at the time, so I went to college for engineering which I hated and eventually dropped out. I bounced around doing oil field, warehouse, and overnight jobs for the next 10 years before finally I was laid off from a steady job I had been working at for 5 years due to cutbacks. What I thought of at the time to be a huge set back turned out to be the greatest turning point of my life because I rediscovered my passion for drawing and this time I never looked back. I have been drawing ever since and have no plans of stopping. I love what I do for a living now. 2. 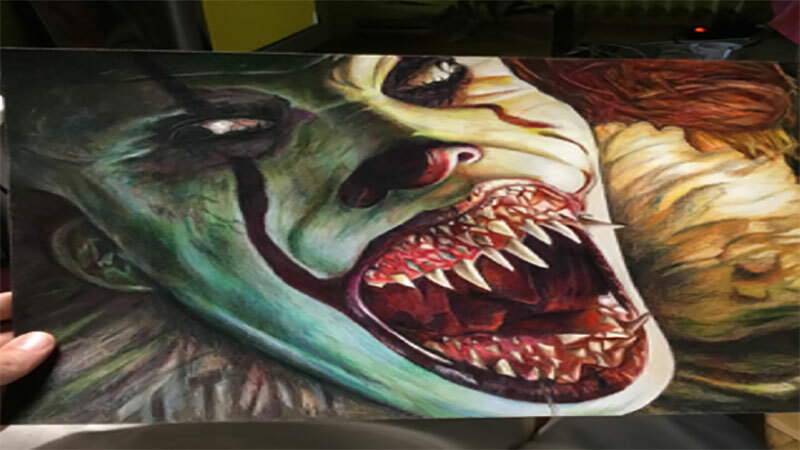 What got you into drawing (specifically horror)? 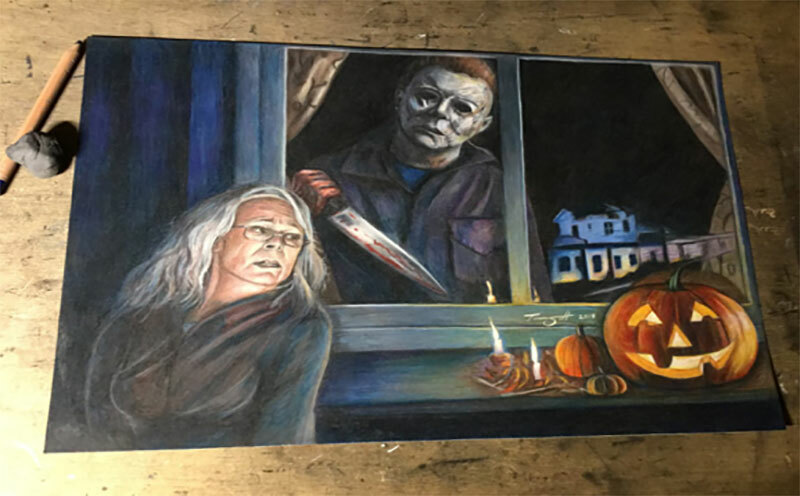 I would say I’ve always been into horror from a young age, but I guess if I really had to pinpoint the things that were the gateway to it all, it would be the original “Halloween” and “Tales From the Crypt.” I must have watched “Halloween” as young as 6 years old for first time with my mom. There were also shows like “Tales From the Crypt” that I would stay up late watching when I was supposed to be asleep, lol. When I was younger I even thought it would be cool to write scary stories and then illustrate my own books. Unfortunately, I’ve never really tried my hand at writing, but the art thing panned out later for me. 3. How do you decide what project you will work on next? Normally when I am deciding on my next project, I refer to my black book of ideas. I write them all down and choose the ones that call out to me the most. I have all sorts of plans and ideas that I write down on a daily basis. A lot of times I will mix and match ideas to try later, but right now I choose specific scenes and try and give my own flair and atmosphere to the piece. Eventually, I would love to have my own concepts with a realistic style and a much more creative portfolio of work. I still feel like I am mastering my techniques though so I have a lot of fun putting in the best work I can in each and every piece I do. 4. How do you decide what will appear in each piece? When deciding what will appear in each piece I try to picture it in my mind’s eye before ever putting the pencil to paper, envision how I want the final piece to look. I feel like if I can see it first, then it gives me a lot of inspiration throughout the project. Often times my best ideas originate when I’m really tired and can’t draw at the moment so I’m in that in between stage of sleep and being awake, lol. 5. How long does it take to complete a personal project versus a commissioned project? When it comes to my personal pieces vs commissioned work I really take pride in every piece of art I make so I try not to differentiate in how much effort I put into a project based on if it’s personal to me or not. Now of course there are some projects where I just lose myself completely and those are usually the best, but I go into every piece with the highest level respect I can and I never rush any of my work. 6. What is your favorite piece you’ve created? If I were to choose my favorite piece to me (that’s a really difficult one, lol), it’s like being forced to choose your favorite child. 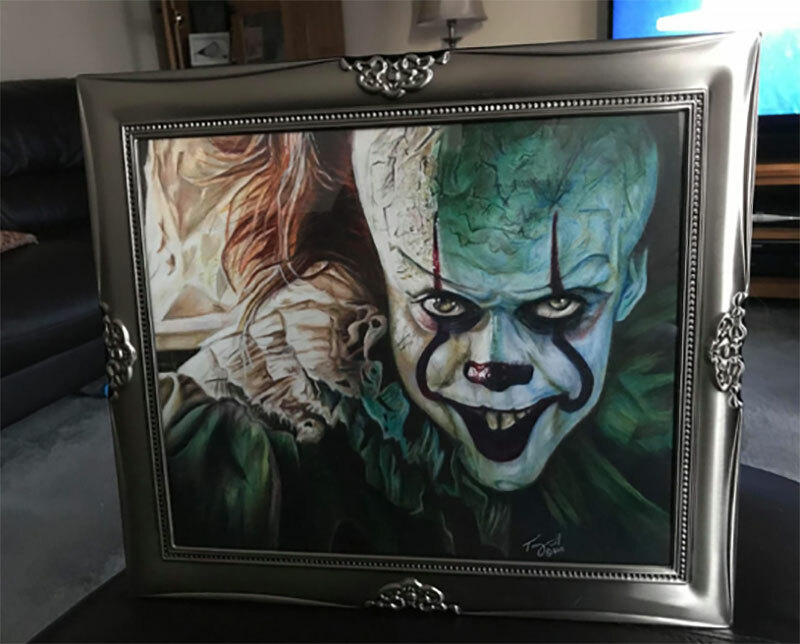 Um, but if I did have to choose one it would be my Pennywise “It Eats You Up” piece because of how original it was to every other artist’s take on Pennywise. It was my most dynamic piece and the colors and saturation I used made it so much fun to work on. It really showed off what I can do when I set my mind to something. 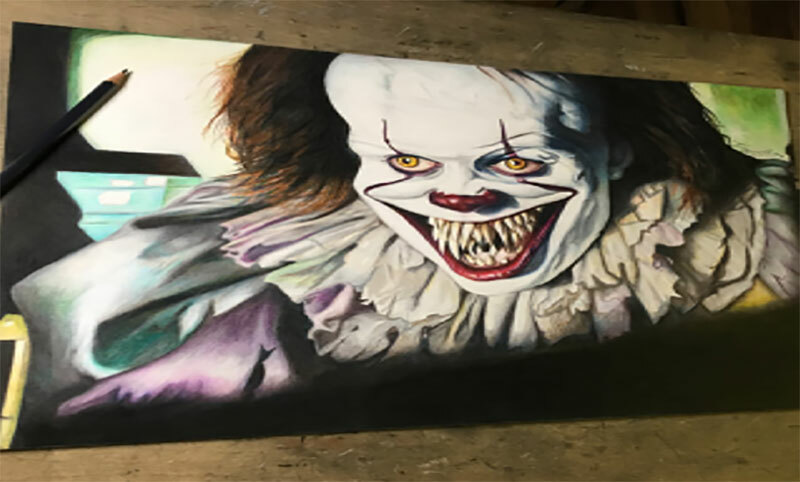 It’s very close though between that one and my other Pennywise called “I’m Not Real Enough For You?” That one might show off my best portraiture skills. 7. What is your favorite horror film and character? 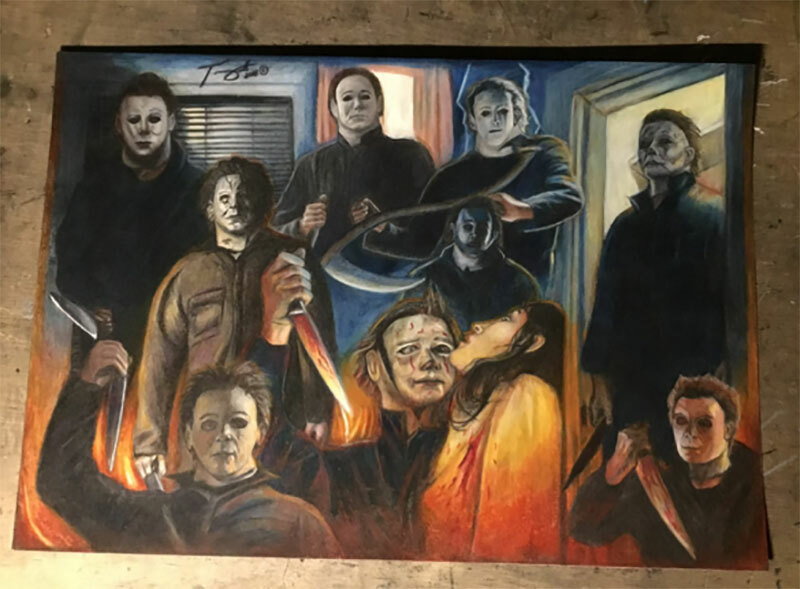 Funny enough as much as I love Pennywise, “Halloween” is my favorite horror movie of all time and Michael Myers is my favorite horror icon. Followed closely by the original “Texas Chainsaw Massacre” which I thought was just so raw and real. 8. Have you ever met any of the actors you have drawn? If so, who was it and how did the experience go? 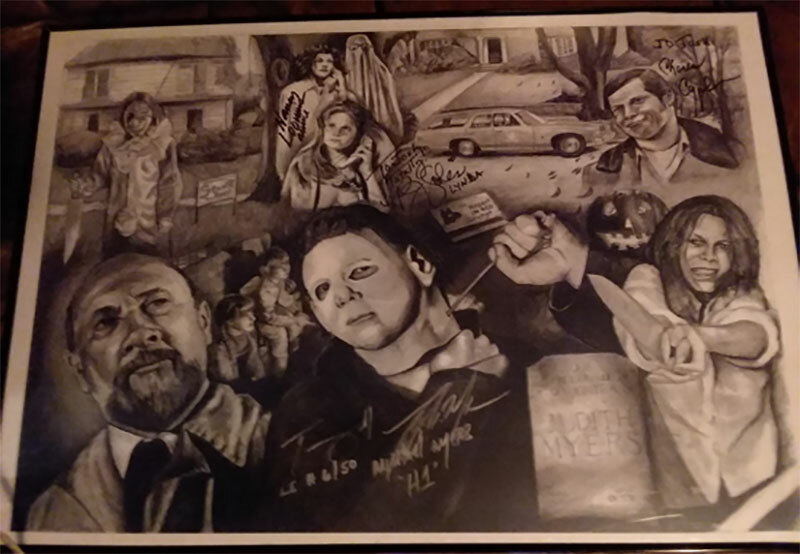 At the horror conventions I attend I have met a few of the actors I have drawn. One of these actors was Sid Haig from “The Devil’s Rejects.” He was unbelievable. He sat down with me and talked to me about possibly sending him prints that he’d sign for me so I could sell them at my shows. All he would ask for in return was a stash of prints that he could sign for his fans. I was blown away by that. I was also able to meet Tobin Bell who signed a Billy the Puppet drawing I did, but it wasn’t actually him in the drawing so that was a little different. He was very kind and I was a little star struck that time so that memory stands out to me. I also met Miko Hughes who played Gage in “Pet Cemetery.” He loved the drawing and he was one of the nicest people you will ever meet. 9. Who is still on your bucket list to meet? Someone I would like to end up meeting one day would be Bill Skarsgard (Pennywise in the 2017 “It”) even though I know it’s a long shot. I feel like he is our modern day Heath Ledger with how he transformed himself into something so abnormal and terrifying in such a genuine way. I haven’t been as struck by a performance in that way since Heath’s Joker performance honestly. 10. If someone was interested in looking and/or purchasing several of your pieces, where should he/she go? If you would like to buy work from me you can find prints of all my work on my Etsy shop at the link Etsy.com/shop/orcuttsartroom. 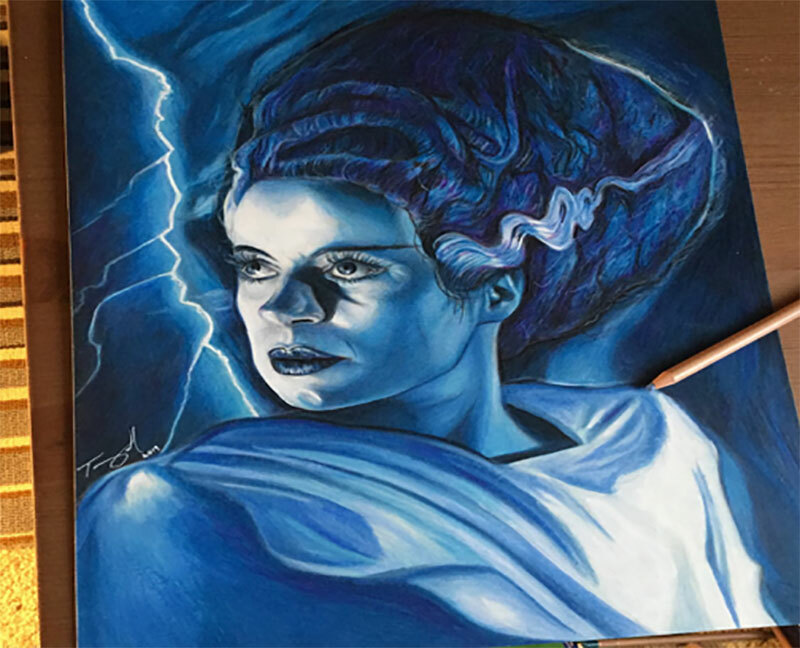 If you are looking to commission or buy one of my originals you have seen its best to message me on Instagram or Facebook. My Instagram is @orcuttsart and my Facebook you can find me under Orcutt’s Art Room. 11. After being on your website, I noticed the prices for your art were very affordable. How are you able to keep your prices so low? I keep the prints of my work very low because I tend to charge what I feel I’m worth on originals, but for those who can’t maybe afford the original work I want them to be able to pick up a print of my work and have it in their home. I have a couple of print shops I’m very close with where I am able to get great quality of work for an affordable price so that’s also how I’m able to keep my prices as low as they are. 12.Where do you see your career in 5-10 years? In five to ten years from now, I would like to see myself grow tenfold as an artist. I would love to be doing my own concepts in a realistic style. 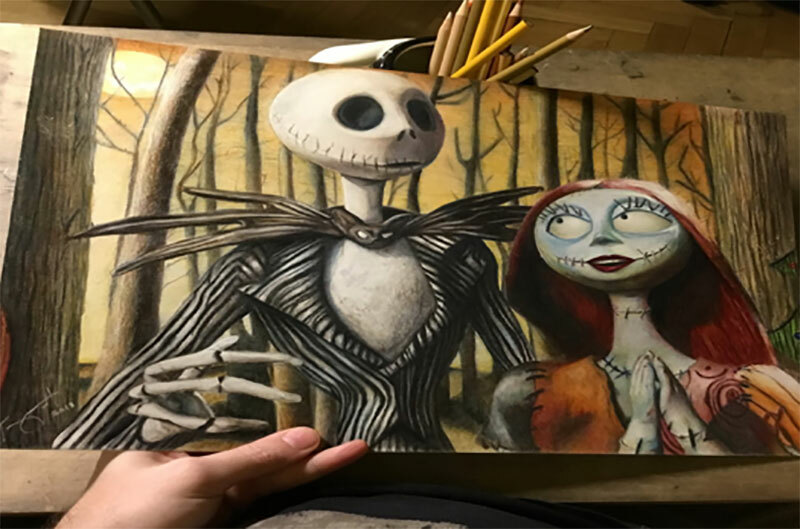 I would also like to become proficient at oil painting and pastel pencils, as well as the charcoal and color pencil work I do now. I would love to be doing much larger work and reach as much of the art community interested in my style of work as possible. I hope to unlock my potential and get the very best of myself in this life and with my art. 13. What has it been like getting paid to do what you love for a living? It has been an absolute dream come true to be doing what I love for a living and have people tell me each day how much they love my work. I feel like the luckiest guy in the world. It fills me with a sense of purpose and I’m constantly waking up wondering what I can do next to be better at it. 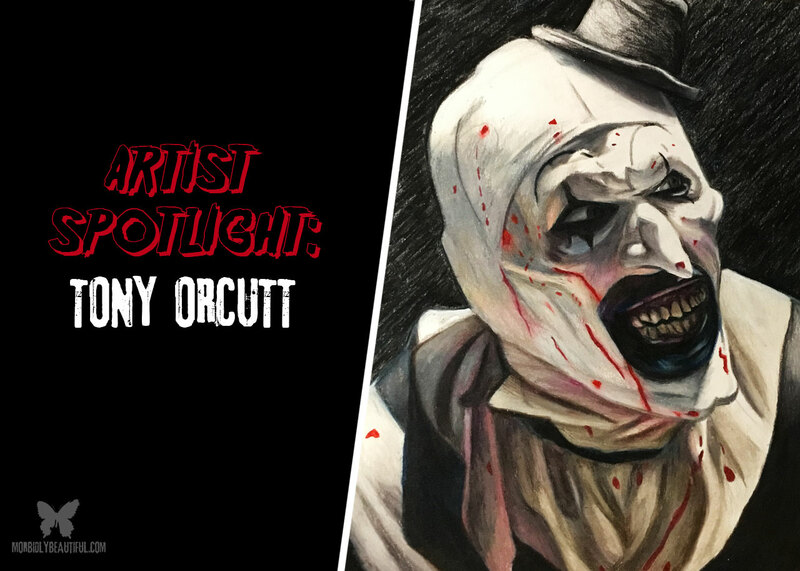 It was honestly an honor to have conducted this interview with Tony Orcutt. 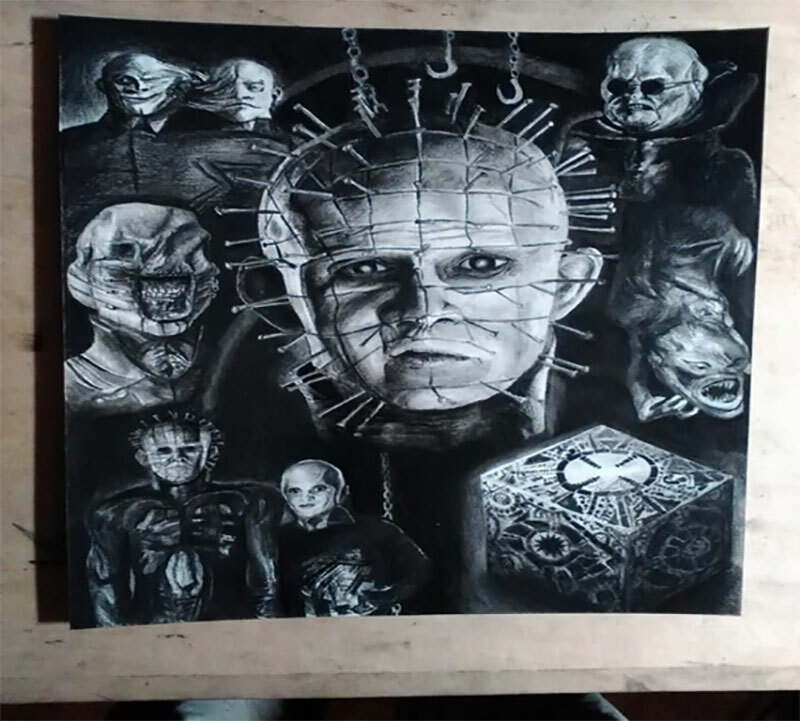 If you are really a horror fan, then you need check out his art. His prints are great for collecting, hanging on the wall, and getting autographs. Oh and by the way, he keeps his art very affordable. 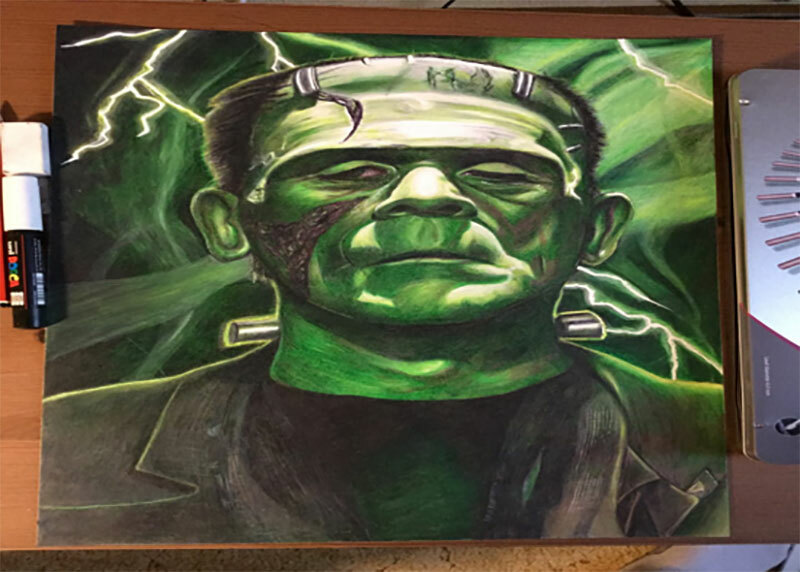 Mr. Orcutt also does awesome work with unique commissioned pieces. 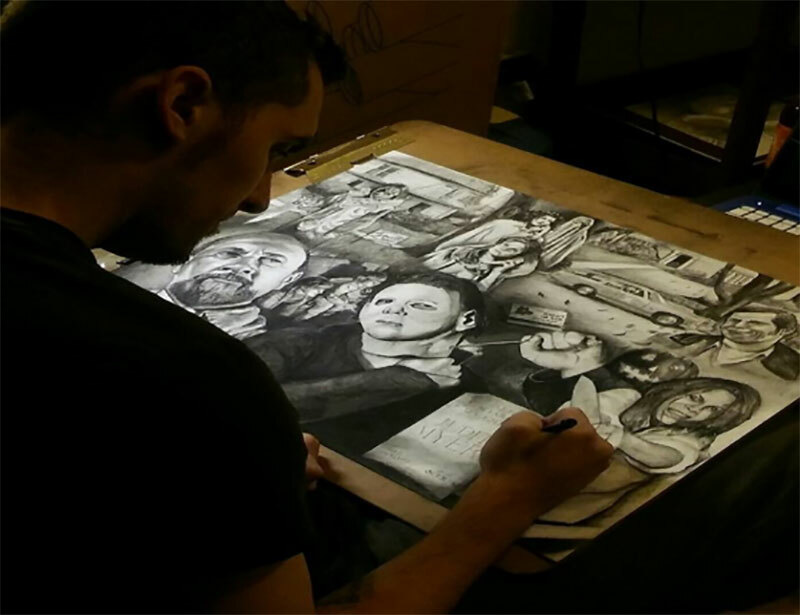 Although my interest was clearly in his horror pieces, he also covers pop culture, music, sports, and comics. 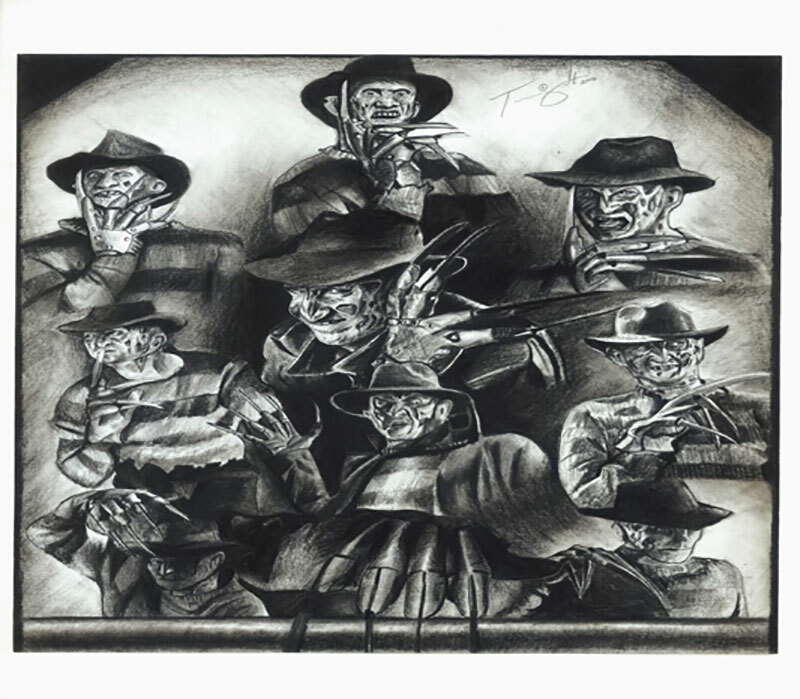 Tony is truly a hidden gem in the art world, but trending up quickly and will soon become the standard in horror art. I met Tony at Scare Fest. Very laid back guy and LOVE his work. Hes amazing!